This was my second multitool I ever purchased and it has been with me ever since it hit the market. 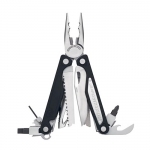 Legend is on par with Leatherman Surge; heavy and very sturdy. It has rubbery grips on handle, smooth edges so you can get a very good grip of the tool without worrying it slipping. Legend doesn't have a plethora of tools but the tools you have are very good indeed. The saw tool cuts through various materials with ease unlike other saws you find in multitools. Also the saw blade is easily replaceable. 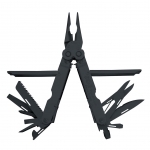 Gerber has put heavy duty pliers, which will take anything you throw at it. The downside is the size. You can't fit these into tight places like with most Leatherman pliers. This is still the best Gerber multitool I've owned/tired.